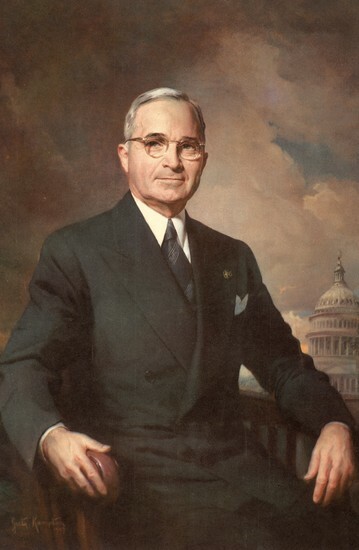 “I’m just plain Mr. Truman now, a private citizen.” So said an overwhelmed Harry S. Truman to a boisterous, affectionate crowd that surprised him as he ventured to a private home in Washington for a farewell lunch soon after his successor, Dwight Eisenhower, was sworn in as president of the United States. It was Jan. 20, 1953. And he really did go home. He had, for almost eight years since the death of Franklin D. Roosevelt, been the most powerful man on earth, the wager and completer of wars and saver of Europe. In his diary Truman wrote of Cincinnatus, the Roman farmer who led in his country’s hour of need and then, work done, returned to his plow. It is what George Washington did. Heck, it’s what Calvin Coolidge, like Truman from modest means, did. Truman would go back to being “just anybody again.” But there was something people didn’t know. He was—amazingly, this wasn’t a lie—pretty much dead broke. Mr. McCullough: “He had traveled home from Washington unprotected by Secret Service agents and there were to be none watching over him. He had come home without salary or pension. He had no income or support of any kind from the federal government other than his Army pension of $112.56 a month.” He had saved a little from his salary but put it in government bonds. In his final weeks as president he took out a loan from a Washington bank to tide him over. He didn’t know how he would make a living. His great concern was not to do anything that might exploit or “commercialize” the office he’d just left. He was offered small fortunes to associate himself with real estate companies and other corporations but he turned them down. Mr. McCullough: “His name was not for sale. He would take no fees for commercial endorsements or for lobbying or writing letters or making phone calls. He would accept no ‘consulting fees. '” Offered a new Toyota 7203.TO -0.71% as a demonstration of harmonious relations between the U.S. and Japan, he refused: It might look like a product endorsement. Anyway, he believed in American cars. Harry Truman, painted by Greta Kempton in 1948. Truman took part in the planning of his presidential library, trekking to possible sites, drawing what he thought it should look like—his grandfather’s house. The federal government contributed nothing, Truman did the fundraising himself. He and Bess took a break to visit friends back in Washington; Truman drove all the way. That was challenging because cops stopped him to warn about speeding but really to get autographs, and patrons of diners surrounded him to watch him eat. When the book came out it sold fine and earned respectful reviews. But friends thought Harry’s pungent, blunt manner of expression had been squashed down and evened out by collaborators, or perhaps by self-consciousness. A bigger disappointment was money. With the cost of staff, researchers and office rent, his net profit, he figured, was only $37,000 over five years. He was shocked he had to pay 67% federal and state income taxes. Truman had supported high tax rates for broad government services pretty much all his political life. There was a sense in his letters this was the first time he personally felt the cost of the policies he’d professed. He called the taxes “crushing.” He pushed for a bill in Washington for office money for former presidents, and—rightly, fairly—got it. God bless him, he did. Why are we talking about Harry Truman? You know. We live in a time when politicians relentlessly enrich themselves. We are awed and horrified by the wealth they accumulate, by their use of connections, of money lines built on past and future power. It’s an operation to them. They are worth hundreds of millions. They have houses so fancy the houses have names. They make speeches to banks and universities for a quarter-million dollars and call their fees contributions to their foundations. They are their foundations. They grab and grub. They never leave. They never go home. They don’t have a “home”: They were born in a place, found a launching pad, and shot themselves into glamour and wealth. They are operators—entitled, assuming. They “stand for the people.” They stand for themselves. So I just wanted to note how it used to be, when leaders thought they had to be respectable. When they were respectable. “Harry Truman, not a money-grubbing slob.” Who, years ago, imagined that would come to be remarkable?